Either it’s a crudely simplified translation by Jan, our guide from Czech Tourism, or that’s what the Czech woman has just said as she passes around crisply folded, thin white sheets. Heavy, clearly audible gulps drop around the tiny changing room as the door closes behind us. Grasping at the sheet and clinging to our soon-to-be-unnecessary clothes, we look around at each other trying to work out what’s happening, as if we’d just been told that we need to strip naked and sit in bath of... oh, yeah. “We don’t wear shorts then?” I ask, gripping to a strange hope that the ones I’d packed would still be of use. “No. Naked with the sheet.” Jan replies. It’s as I slip off my shoes that I really wonder what I’m doing. The promise was a beer bath. Put another way, it was a bath in beer. Now we’re standing in a changing room, cold tiled floor beneath our feet and hand-painted pictures on the wall in a Ralph Steadman meets Quentin Blake kind of way. Barely a stretched-out arm from each other we silently and awkwardly undress, stuffing our clothes into a locker and wrapping our dignity beneath the see-through sheet. The Czech woman – short, rather dramatically made-up – returns to collect us, opening the door in a way which suggests sees seen it all before and really doesn’t care. She leads us through to the baths, a small, open area with curtains closed around it, piped music playing quietly. Here, waiting for us, is Christiano Ronaldo’s rugged lookalike, a beaming smile and open arms, pulling across the curtain and revealing the squat bath. 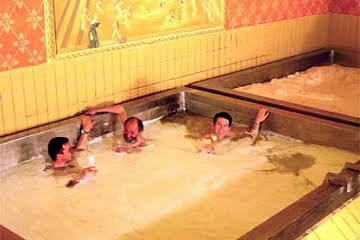 On top of the bath is a thick foam spread across the water, literally like a giant pint of beer served in a silver tankard. My eyes immediately notice the golden glass of beer next to the bath, condensation dripping down the sides; a comfortingly recognisable beacon in the middle of a very unusual experience. The less pretty Ronaldo still smiles, his eyes directing me towards the bath, nodding towards it eagerly. Aware that this is a rare moment in my life which mixes awkwardness and brilliance in a perfect balance that must be captured on film, I take a quick photo, trying to juggling the sheet, a phone, a camera and a camera case, while Christiano Mark II watches on politely. “Just don’t get a picture of me in here.” I laugh as I turn the camera off and put it on the chair beside the bath. To either side I see shadows of men climbing into their baths and reclining with ohhs and ahhs as the curtains close behind me. The top of the bath is thick, speckled with what looks like tiny hop pieces, slightly mottled brown at the edges, possibly sticky but I can’t tell until I touch it. 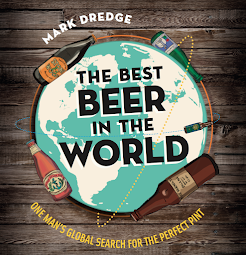 I unwrap the sheet and lay it to the side, stepping into the warm water, slipping down through the foam as the smell of fermenting beer circles around, a lovely wort-like sweetness. Just as I disappear below the bubbles and with my shoulders and head still dry, the curtains reopen and the tanned chap with the greased-back hair returns, disturbing my recently-rediscovered privacy. “I take your photo,” he says, smiling, while making the universal photo-taking gesture. Presumably, my ‘don’t take a picture’ comment was misheard and mistranslated, but how can I say no now? Slipping and splashing I hand him the camera and attempt (and fail) to create a foam-shaped shield in the water above my lower regions, before grabbing the beer and saying cheese. 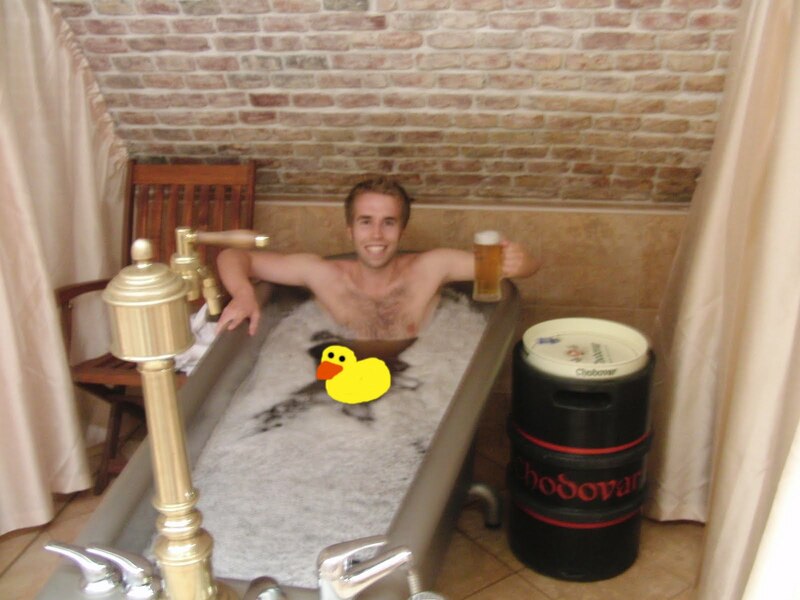 He nods to say the photo is good and returns the camera, pulling the curtain shut, leaving me alone in my beer bath. The water is so satisfyingly warm without being too hot, while the foam gently pops against the skin, not sticky but still clinging. The beer in the glass is cold and delicious and a rare treat to drink in the bath. It would all be very relaxing if it wasn’t for the giggling that I try so hard to suppress throughout, a giggling that at one point threatens to break into a full-on laugh (one of those laughs that gets funnier and funnier inside, increasing with intensity as you think about how funny it’d be if you actually laughed, making you want to laugh even more, and so on). I’d never experienced anything like this before. 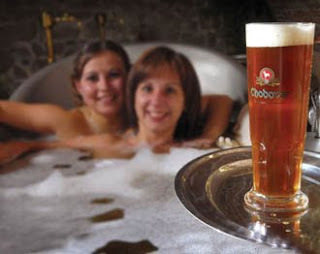 The bath is filled with mineral water, yeast, hops and at least 8 litres of dark beer. It’s proven to lower blood pressure and help with circulation. Around I can hear elevator music broken with the occasional splash, sigh of pleasure or swallow of beer. Finally relaxing, I feel my arms and legs getting lighter and floating to the surface, the hangover I’ve been fighting with all morning is finally drifting away, the aching behind my eyes dispersing. This is nice. Avoiding the curious desire to take a gulp of the water I’m lying in, I finish the glass of beer instead. Just as I’m ready to fall asleep the 20 minute bath-time is up and our guy returns, opening the curtain. I expect a nod and for him to say that I need to jump out and follow him, instead he walks in, takes my sheet and holds it out in front of him and waits. I don’t move. He looks out from over the sheet at me. I stare back, unsure. “You get out now,” he says. I still don’t move. Finally I get it. This guy wants me to get out of the bath and then he wants to wrap me in a sheet. Here we go. I stand carefully, not wanting to slip and fall. I climb as gracefully as a naked man covered in beer can and then back myself like a reversing tanker into the sheet, which falls across my shoulders, immediately turning more see-through. “Follow me,” he says to us as we all wait, walking off as I wrap the towel around me, ensuring nothing is hanging out beneath. With the patter of wet feet we follow him into the next room which is a dark, bricked red room. Another beer is served to us as we lie down for 20 minutes, air-drying, drifting to a gentle sleep, completely chilled out. We’re told to dress again after it’s done and not to shower for at least four hours (for the full effect of the water, apparently). I leave totally relaxed, my skin cleaner and softer than before, a joy inside of me bursting out: the last hour was wonderfully unique, strangely excellent and so much fun. The awkwardness is just shocked Brit in me; in reality it’s tasteful, charming and sensitively done, more importantly it’s a bath in beer. We all return to the restaurant and sit down to eat, everyone delighting in the last hour’s entertainment, invigorated, unlike anything we’ve done on a beer trip before. I can’t recommend the baths highly enough. 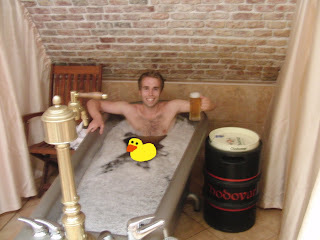 For about £20 you get the bath, the relaxation after and the two beers. In fact, the whole of the Chodovar site is excellent with a range of good beers, two restaurants, a spa and hotel. One of the restaurants is in the old granite and sandstone cellars where the beer used to lager, filling the air with a wonderful clean mineral smell and mixing it with the roasted meat aromas of Czech food. The unfiltered 11° yeast lager straight from the cellar is delicious (and only served at the brewery), made even better as the barrel-chested brewmaster Jiri Plevka talked to us about the history of the brewery and his family before taking us on a fantastic tour of the grounds, including the cellars, leaving us to enjoy the bath and then a gut-filling meal with more beer (Pete has already written about the place). Not your usual brewery visit... and all the better for it! Good piece Mark even though you had to preserve what 'little' dignity you have, thanks mate. Awesome, that's on my to do list next time i visit! Beyond awesome. Everytime you write a travel blog you make me add to the places to visit list. Great stuff. Love it! Mark, you never cease to amaze me!